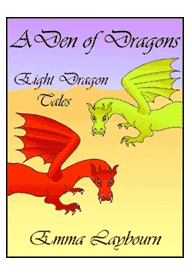 THE DRINKER OF TIME: a free dragon story for older children - read online, print or download. Matilda clattered down to the kitchen, her comb in her mouth, trying to pull her hair back into its scrunchie as she leapt down the stairs two at a time. Monday mornings were always one long rush. As she reached the bottom stair, Matilda realised that she had left her school bag upstairs under the bed. She groaned, letting the comb fall to the floor. --and into Sunday night, with her last-minute homework spread out all over the breakfast bar. Matilda recognised the graph she had struggled so hard with: there were shreds of rubber all over it. Outside the window, it was dark and Dad stood at the stove cooking pikelets for supper. He turned a faintly bewildered face to her. "Not toast," he said. "We have pikelets on a Sunday night. It is Sunday, isn't it?" --no, a quarter to ten and her mother was in front of her, ready to go to church for the morning service. Matilda watched her mother pick up her handbag and inspect it with a puzzled expression. "Haven't I been to church already?" she asked. Her father threw down the Sunday paper. "I've read this page!" he exclaimed. Matilda realised she was holding her swimming costume. It was dry, although last time she'd seen it, it had been draped soggily across the radiator. She dropped it as if it had just turned into a snake. "I went swimming yesterday," she declared. "Why is it Sunday again now?" As Dad opened his mouth to answer, all the lights went out. Matilda found herself lying in bed. She was sure she hadn't woken up: rather, she had just arrived here. A breeze ruffled the curtains. She rolled over to peer at the luminous hands of her clock. It was ten past four. She could hear faint snores coming from her parents' room. She switched on her bedside light and checked her phone to see if it was still Sunday. It was, though that was no great help. Matilda thought for a while and then said to the empty room, "I can't be doing with this, you know. I'm losing great chunks of my life, backwards." She worked it out. The first chunk she had lost had been almost thirteen hours: the second had been less than ten hours. The third gap was only five and a half hours. Maybe the effect, whatever its cause, was running down. Wearing itself out. She glanced at the clock again. It was twenty five past two. "Good," said Matilda. "At this rate I might get some sleep before yesterday evening." And she switched off the light and wriggled down under the quilt. She woke up, sure enough, on Sunday morning. The day progressed exactly as it should have, apart from the fact it that it was for the second time. Although Dad grumbled about how predictable his weekends were these days, nobody but Matilda seemed to have noticed anything seriously wrong. When she went back to school on Monday, she tried to raise the subject with her friends. All she got were blank looks, so she kept quiet. Then, at two o'clock on Wednesday afternoon, time started disappearing again. Matilda turned a page of her history book to find herself in the middle of Tuesday's French lesson. After a few minutes of passive verbs she was back in that morning's assembly. Then it was backwards in diminishing skips and jumps all the way to six o'clock on Friday. Dawn was breaking, and Matilda was in her pyjamas. She leapt out of bed, extremely angry. "I am not having Friday again!" she announced. "I got a C minus for maths and I fell off the apparatus in gym. Everyone laughed at me. I'm not going through that again." She glared at the clock. "Just you dare," she told it. "I want to know who's responsible for this!" There were three bangs on the bedroom wall. "Shut up, Matilda," came her mother's muffled voice. "It's too early." Matilda shut up, and brooded. She brooded for the next two days, during which she had to fall off the apparatus, bruising her hip and her pride, and suffer the teacher's scathing remarks about her algebra. On Saturday she went swimming and had a familiar argument with her friend Elaine, and got just as annoyed as she had the first time round. By the time she got to her third attempt at Sunday, Matilda was seething with frustration. She'd tried to change her actions, but it was almost impossible. It was as if the day was laid down in predetermined tracks. She couldn't stop herself from arguing with Elaine. If she did manage to alter her words or her behaviour, even slightly, it suddenly felt as if she was wading through treacle; like when she tried to run in her dreams, only to find her feet glued to the pavement. So, once again she had to fail at the new computer game, forget to charge her phone, spill gravy all down herself at tea, finish her homework late - getting the graph wrong for the third time - and rush to be ready for school on Monday morning. --was abruptly porridge. In the kitchen. That meant last Thursday. Matilda checked the newspaper to make sure, and stood up, bowling her chair over. "I am not doing it all again!" she bawled at the top of her voice. And although it wasn't easy, she picked up her bowl - which suddenly seemed to weigh a ton - and tipped the porridge in a slithery lump into the sink. --became a dark, misty night. Street lamps glimmered hazily through fine drizzle. That was Wednesday. She was being thrown further back in time than ever. This had to stop. So Matilda then did something she had occasionally contemplated. The bridge was not high, and the river below was deep and slow, and in summer at least, was probably quite swimmable. into the jaws of the dragon. It was surprised. It coughed and spat her out. Matilda did a backwards roll and knelt up on the sand, nursing a grazed elbow. The dragon's head was as big as a bus. Behind the head, its body humped and trailed away like a scaly hill, as yellow as dull brass. Two stumps on the hill must be its wings, Matilda decided. They were very rudimentary. It could hardly fly with those. She seemed to be alone with the dragon in the middle of a greyish desert. In the distance, shimmering sand melted into a hazy orange sky. "What were you doing?" cried the dragon. It had a whistling, squeaky voice, and it sounded horrified. Matilda stood up and brushed herself down carefully. She was so angry she could hardly breathe. "I might ask you the same question." "You jumped right off that bridge!" "Oh, you noticed," said Matilda. "But you could have died, and that would be absolutely terrible!" "Yes! It would have ruined all my plans!" Matilda sat down with a thump. All of a sudden she felt very tired. "Oh yes. I couldn't have gone on. I'm not supposed to actually alter things, you see." The dragon heaved itself onto huge, splayed feet and took a few lumbering paces. It moved in slow motion. At each footfall, the ground trembled and the air shivered. That must have been how dinosaurs moved, thought Matilda tiredly, although the dragon was at least ten times bigger than the hugest dinosaur. The dragon rumbled down to the river. This was not the same river she had tried to jump into. It was made of light. It emerged from the sand and flowed across it like a rainbow until it sank and disappeared again. "It's going too fast!" the dragon wailed. Bending its giant head it drank deep, gulping at the rainbow. As it raised its head to swallow, the river ebbed and eddied, flowing backwards to fill in the gap. The dragon dipped its head and drank again; paused, and drank a third time. Each time it swallowed less than the last. It lowered its head for a fourth attempt, but instead, with a moan, slumped down on the riverbank. "I can't drink any more," it said in its whistling voice. "I'm just too full. And I've only managed a week." It blinked an eye as big as a table and a giant tear rolled out like a glistening football, to hiss and steam as it sank into the sand. "A week!" said Matilda. "That's my life you're swallowing." The dragon raised its fearful face. "Oh, no," it assured her. "It's only time. You don't lose anything. You just get to live it all again." "I don't want to live it all again!" "Don't you? I thought you'd be happy to relive your life. I'd love to go back - wouldn't you?" "No," said Matilda. "Once is quite enough. Why do you want to drink time?" Another huge tear hissed into the sand. "I've lost the other dragons. I don't know where they are, and I'm so lonely." "But how is swallowing time going to help?" "They must be somewhere in the past, you see," explained the dragon. "If I can only go back far enough, I'll find them. Do you know where they are?" it asked with sudden hope. "Do you know anything about the other dragons?" "Dragons are mythical," snapped Matilda, and then wished she hadn't, because the beast looked so unhappy. "They must be a very long way back indeed, then," it said dolefully. "I'll just have to keep drinking." Lowering its head ponderously, it took another series of noisy gulps from the rainbow river. It ignored her, drinking ravenously. "Aaah," it sighed at last. "Two weeks that time. But I'm very full." "Dragon, you'll never find them that way." "But I've got to!" it wailed. "I want them so much. I've got to get them back." "You can't make time go backwards," said Matilda. She pointed to the eddying river. "Look, it's already catching up again. You'll just end up where you started." "Sit down. Have a rest. And stop crying, for goodness sake." The dragon lay down with a long whump. A fountain of sand flew up from either side of its belly. It gazed at Matilda with imploring, mournful eyes. "Tell me what to do, please!" "Well, could you fly away and find them?" She eyed its stubby wings doubtfully. "I'm only young," said the dragon reproachfully. "They haven't grown yet." "You mean you'll get bigger?" "Only my wings," said the dragon. "Please tell me how to find the others." She shook her head. "I can't. Dragons don't exist in my world, you see." "What!" it squeaked. "But they must! Otherwise how did you know I was one?" "Stories," said Matilda. "There are no dragon fossils. No traces. You're just stories, inside people's heads." But Matilda was thinking aloud. "Drinking time is no use. Dragons have nothing to do with time. You won't find them that way. You need to look somewhere else." "Humph! I suppose I need to look inside your head!" "Inside the stories," she corrected firmly, in case it got the wrong idea. "I don't know any dragon stories," it said petulantly. "I only know about me." "You must have heard of Saint George!" Matilda hesitated. "Not exactly. Listen." She sat down cross-legged by the dragon's ear, and started to tell it the story of Saint George. Since the idea of the dragon getting killed made more enormous tears plop down into the sand, she quickly changed the ending, so that Saint George had a ferocious battle with the dragon and then knighted it for bravery. "More! More!" cried the dragon. So she told it about the dragon that fought the Iron Man, and won. She told it about Smaug and the Midgard Serpent and the dragon that guarded the Golden Fleece. She told it about the Reluctant Dragon and Custard the Dragon. Most of these stories were transformed in the telling. Jason, for instance, did not get his Golden Fleece: he got horribly devoured. Every time she halted, the dragon cried, "More! More!" Coming from a well-armed mouth the size of a bulldozer, this did not seem to be a request she could refuse. So she told it about Welsh dragons and Chinese dragons and Arabian dragons. When her memory failed her, she just made it up. Meanwhile the dragon listened intently, sprawled on the ground, for story after story, hour after hour. Matilda had never in her life had anyone listen to her so attentively. All of a sudden, in the middle of the tale of Jack the Giant-Killing Dragon and his golden eggs (for Matilda was free-wheeling by now) the dragon stirred its massive head. "What's that?" it squeaked. "Look! Over there!" Matilda squinted at the haze. "It's them! It's them!" The dragon surged to its feet, knocking her over backwards. She sat up and squinted harder. Perhaps there was a glint of golden in the haze; no, several glints. "You found them! You made them come for me! You did it!" cried the dragon. It lashed its tail excitedly, setting up a sandstorm. Matilda had to close her eyes. When she reopened them, the dragon was lurching across the swirling river. "I'm off!" it squealed, as it lumbered away towards the horizon, its tiny wings waggling for all they were worth. Matilda watched until the orange cloud of dust behind the dragon gradually hid it from view. At last the ground stopped shaking. She was left alone with the unchanging sand and sky, by the side of the rainbow river. She sat there for a while, watching the river flow, and sprinkling sand between her fingers. "This is all very well," she said at last. "But I can't stay nowhere. Things have to change. They'd better change. But they won't unless I go back." She sighed, contemplating algebra and gym. They wouldn't last for ever. Nothing would, unless she stayed here. So there was only one solution. Matilda got to her feet and stood at the edge of the river. "I suppose I can always make up stories for myself," she murmured. and arrived to toast for breakfast, on the dawn of a new day.